President tours Camp and Woolsey Fire devastation and meets with families of Borderline Shooting. 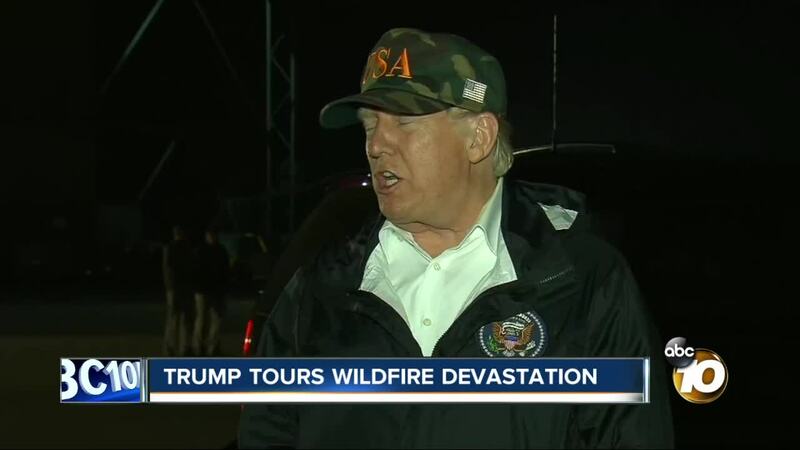 (KGTV) — President Donald Trump Saturday toured the destruction left behind by one of California's deadliest wildfires ever. The visit comes as the Camp Fire's death toll increased Friday, with authorities announcing 71 people have been killed and 1,011 people remain missing — though not everyone is believed to be missing. The Camp Fire ignited Nov. 8 and chewed through Northern California, virtually decimating the town of Paradise and ravaging nearby communities. "Nobody would've ever thought that this could've happened," Trump said while standing with Gov. Jerry Brown and Gov.-elect Gavin Newsom. "The federal government is behind [California]. "We're all going to work together ... This is very sad to see," he added. 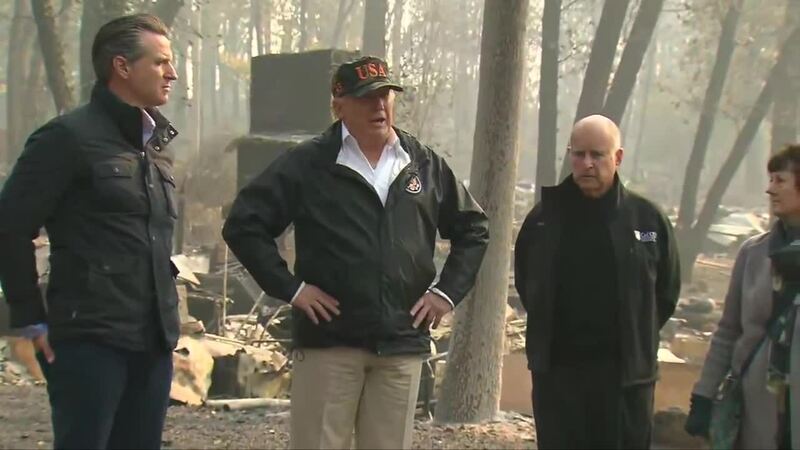 The president also met with Cal Fire, FEMA, and forest officials. The fire has destroyed more than 12,000 structures, many of which are homes, and charred 148,000 acres. As of Saturday morning, the blaze was about 55 percent contained. In addition to those killed, three firefighters have been injured battling the fire. "We've never seen anything like this in California," Trump said after meeting with officials. "It's like total devastation." It wasn't clear if the president would also visit Southern California, where wildfires have also wrought destruction this month. President Trump's visit comes one week after facing backlash over his initial comments regarding the fire, in which he cast blame on California's forest management and threatened to withdraw federal aid to provide fire relief. He followed those comments expressing appreciation for firefighters on the front lines and telling Gov. Brown the White House is "with him, and the people of California." It's the president's second trip to the state following his visit to view border wall prototypes and attend a political fundraiser last year.